A little break from 'Death of a Dreamonger' to talk about something I went to see on Friday at the studio of St James Theatre. First, I have to say, I don't like the St James Theatre. It was built last year and is as anonymous as anything else, could as easily be a travelodge or one of those luxury flats they are busy sticking in any spare space in London at the moment. I must also admit that I didn't like the price. £17.50 seems a lot to pay for a one man show with simple staging which lasts for just over an hour. I later found out that the profits from the show went to a charity, which is fair enough but I'm sure the £5 they were asking for half a pint of beer was not. Then they asked me if I wanted to pay a donation to the theatre on top. Putting all that aside and talking about the performance, it was written and performed by a man called Stephen Oxley and he did brilliant things with it. My favourite part was when, in the middle of telling a story he suddenly ducked down and crawled before 'emerging' and standing up. We were then told he'd drawn a curtain over the previous scene and the audience realised that he had just wriggled his way out from under that curtain. The digressive nature of Tristram Shandy was played brilliantly for laughs, the joy and eagerness with which 'Tristram' as the narrator kept getting sidetracked. He promised to tell it straight in the second half but could not resist a few digressions, especially when going through his chest of props and goodies. The bawdy in the book was well represented. From the spirited impersonation of his conception (followed by a comment that he wouldn't tell us about his birth till we were better acquainted) to a whispered aside to an audience member that so shocked her she gasped. He played that Shandian game of informing us that a nose is definitely a nose, whilst making it abundantly clear it probably wasn't. The representation of some of the minor characters was quite pantomimish but it added to the fun and Parson Yorick was played by a skull. Alas, we didn't have Yorick's death though (I thought maybe a blackout to represent the black page). Nor did we have the eternal curse or the business with Obadiah's knots but there was a lot of the good stuff there with proper and due attention paid to Uncle Toby. 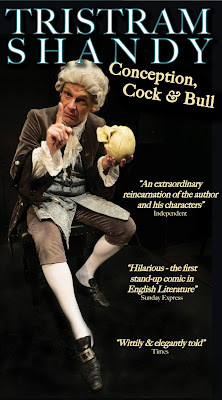 So, I did enjoy myself, but I'd have liked it more for a tenner in the Dictionary Garrett in Dr Johnson's House...notwithstanding Johnson's own opinion of Tristram Shandy. 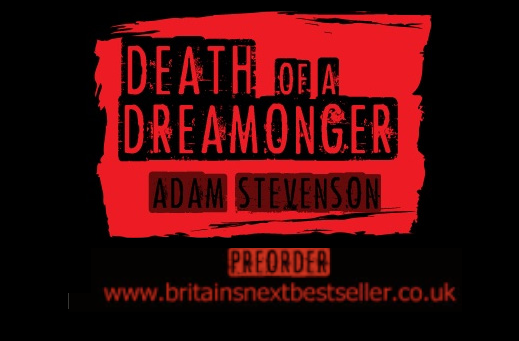 Oh... and if anyone does wish to be in on something special and preorder my book, click the picture below.